The protest camp has been constructed and destroyed 11 times. 15 people have been arrested, and 36 have been injured. Local residents and activists from across the West Bank are attempting to prevent Israel from forcibly relocating Bedouin from their current homes. Since the beginning of February the Jerusalem Gate protest camp in Eizariya has been constructed and destroyed 11 times. Local residents and activists from across the West Bank are attempting to prevent the construction of buildings to house Bedouin communities who are being forcibly relocated from their current homes in the E1 corridor North and East of Jerusalem. Several aspects of what the demonstrators are protesting against are illegal under international law. The confiscation of land belonging to residents of Abu Dis and Eizariya, the forcible relocation of Bedouin Palestinians, and the planned extension of the illegal Ma’ale Adumim settlement to Jerusalem are all moves that contravene international law as set out in the Fourth Geneva Convention. The resilience and determination of protestors and activists demonstrate the significance of what is at stake. Bedouin Palestinians have been forcibly relocated several times since 1948, having been systematically targeted with massacres, individual murders, the slaughter of their livestock, the destruction of their homes, and psychological intimidation. Their traditional way of life and their livelihoods have been persistently undermined, to the extent that many members of Bedouin communities have sold their livestock, no longer having access to lands they would previously use for grazing and agricultural cultivation, and are now struggling with unemployment or exploitative work, and poor health and educational provisions. The latest moves to relocate them onto land belonging to residents of Abu Dis and Eizariya also brings them into conflict with non-Bedouin Palestinians. Munther Amira, head of the Palestinian Popular Struggle Coordination Committee, spoke to us while activists still had intermittent access to the site, and were therefore able to reconstruct the camp while the Israeli military were away. Since then, the Israeli military have started occupying the land on a permanent basis, preventing those engaged in popular resistance from continuing their efforts to maintain their presence. Demonstrators continue to daily gather on the road by the site and face stun grenades, tear gas, pepper spray, rubber-coated steel bullets, arrests and imprisonment. In addition to threatening existing landowners and Bedouin Palestinians, the plan to extend Ma’ale Adumim and incorporate it within the municipal boundaries of Jerusalem threatens the future of Palestinians in two major respects. Firstly, it will close most roads that connect southern West Bank cities to northern ones. It is part of an on-going strategy to cantonize Palestine, positioning the entire Palestinian population of the West Bank within relatively isolated Bantustans that depends upon permission from Israeli authorities for all travel and the transfer of goods and services between townships and urban centres. Secondly, it is part of the ‘Jerusalem Master Plan 2020’, the latest in a longstanding strategy to Judaize the city and ethnically cleanse it of Palestinian residents. Palestinians in Occupied East Jerusalem continue to face a significant degree of discrimination in many aspects of their lives, including home demolitions, planning permits for construction work, taxation, education, travel rights, and the exposure to violent ‘law enforcement’ agencies. With the planned extension of Jerusalem to incorporate illegal settlements in the West Bank, Palestinian residents will be further marginalised, paving the way for further discrimination, which is designed to make life as unbearable as possible. 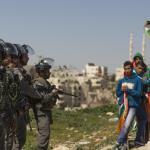 Israeli authorities hope that these moves will change the facts on the ground sufficiently enough to put an end to Palestinian aspirations to have right of access to Jerusalem restored and have the city return as a political and administrative centre in which Palestinian political and economic institutions can be based. "Israeli plans to steal this land from residents of Eizariya and Abu Dis, to displace Bedouin Palestinians against their will and against their interests, their plan to tear the West Bank apart, ethnically cleanse Jerusalem and further subject Palestinians everywhere to violence, intimidation, humiliation and dispossession, will always be met with resistance. Palestinians will never forget the crimes that have been committed against us, and will never stop fighting for justice and freedom. We need more unity and more international support in our struggle, but we will go on fighting, regardless”. The solidarity of Palestinians from different areas and international activists is very important to make the movement strong. Please share this story with friends and family, and let the word know what happens in Palestine. If you would like to support the Palestinian people in this effort to stop Israel's latest colonial plan, you are welcome to join us in the coming days. Donate Now: Palestinian popular movements ask your support!